When it comes to favorite foods of mine, hash browns are right up there. Who can resist golden, crunchy potatoes? 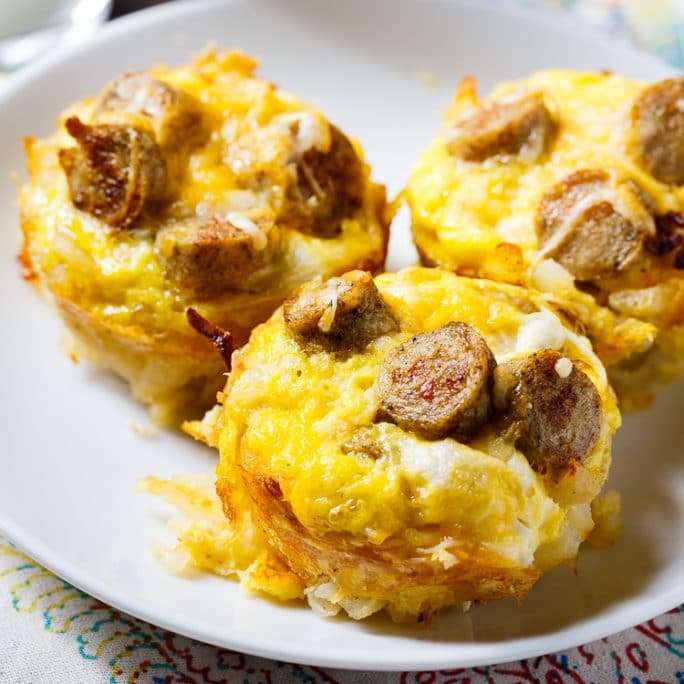 Making hash browns into Sausage, Egg, and Cheese Hash Brown Muffins turns them into a protein-packed breakfast that will keep you full of energy until lunchtime. These Hash Brown Muffins are super easy to make. They start with crispy hash brown cups that get baked in muffin tins. Then eggs, sausage slices and cheese get poured on top and they get baked some more. These handheld hash browns are great for an on-the-go breakfast or snack. For ease and convenience, I use Simply Potatoes® Hash Browns. They are easy to have on hand and are delicious as is or in your favorite recipe. They are made with fresh, never frozen potatoes. I used the Southwest Style Hash Browns, but regular would be just as delicious. For the sausage, I used al fresco Chicken Sausage. 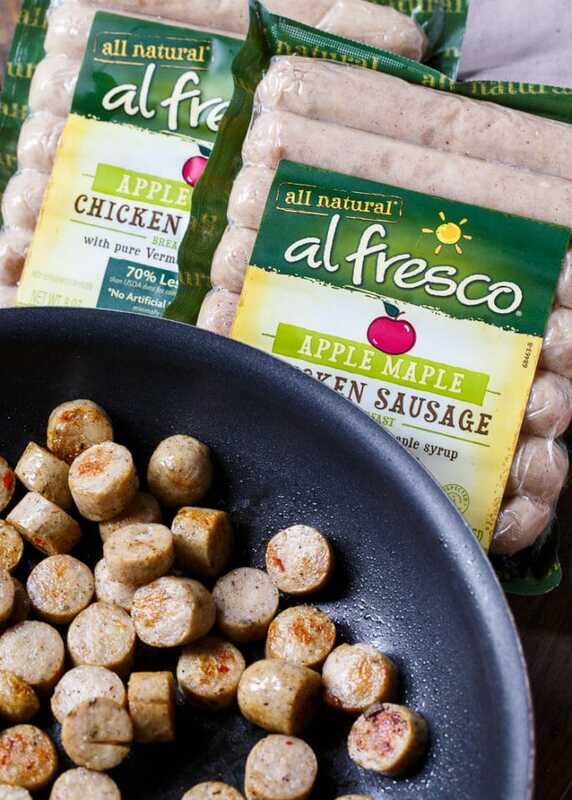 al fresco is the #1 better-for-you sausage brand in the US and their products have at least 50% less fat than traditional pork and beef products. They are 100% all natural with no artificial ingredients, no preservatives, no nitrates or nitrites, and no MSG. Plus they are gluten free. If you’re looking to get a little healthier this year, these are great products to try. al fresco has a line of more than 30 flavorful and healthy chicken products including meatballs, burgers, and bacon. 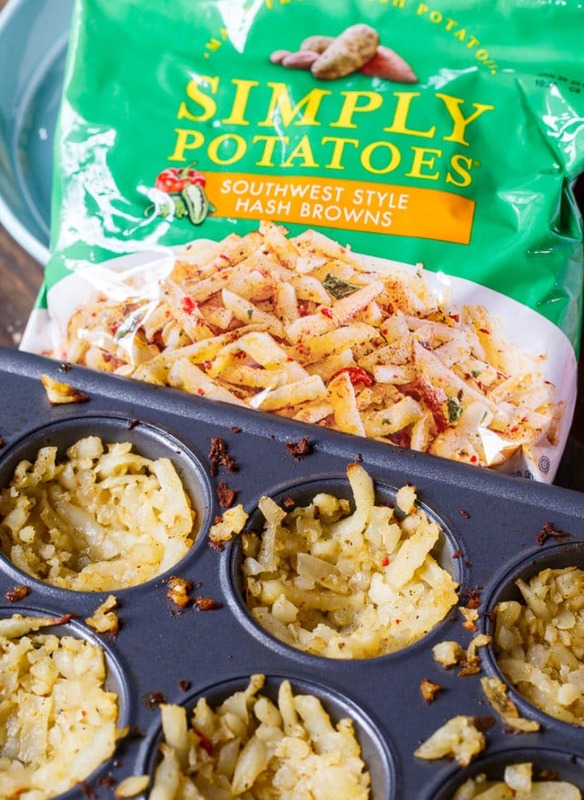 Simply Potatoes has lots of products to help you make delicious meals. See them here. Follow Simply Potatoes on Facebook, Twitter, and Pinterest for more recipe ideas. Preheat oven to 400 degrees and grease a 12- cup nonstick muffin tin really well. In a medium bowl, stir together hashbrowns and butter. Divide mixture evenly between the 12 cups, pressing it into the bottom and up the sides. Bake for about 14 minutes, or until starting to brown. Meanwhile, cut sausage into quarter inch slices and cook in a lightly greased nonstick pan until browned. In a medium bowl, whisk together eggs, milk, salt and pepper. Stir in 1/2 cup cheese. 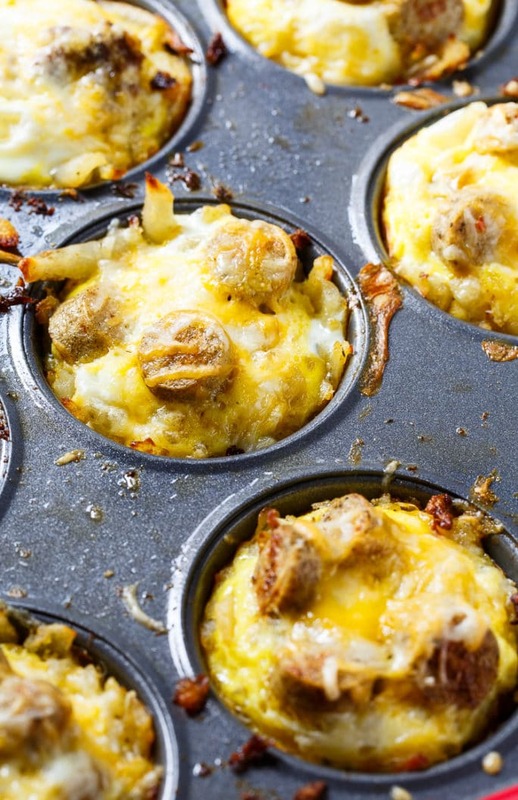 Add sausage slices to hashbrown cups and then divide egg mixture evenly between cups. Sprinkle with remaining cheese. Bake 12 to 14 minutes, or until set. Use a knife to run around edges and remove each one. One reader will win a Lodge. Great for getting your hash browns super crispy! To enter leave a comment below letting us know your favorite way to serve hash browns. Must be 18+ years old and live in the US. Giveaway ends January 31, 2017. I love my hashbrowns with bacon and lots of cheese! I like my hashbrowns crispy with lots of black pepper served with sausage, eggs over easy and toast. I love to eat hashbrowns with eggs and bacon! I like my hash browns cooked in a cast iron skillet extra crispy with bacon, sausage, ham and some cheese. I am a breakfast waitress and the cook will make this for me once in a while. These muffins look so good. They have everything my 11 year old likes. This may be added to our bus stop breakfast lineup. We love hash browns used in casseroles with lots of cheese. Kind of surprised these muffins didn’t include sliced and diced jalapenos (“Spicy Southern Kitchen”) or some delicious Piquillo Peppers. I’ll be adding some kind of pepper to this recipe for sure. Thanks though for the basic idea. I must have Hash Browns with my eggs! Just some salt, pepper & ketsup will do fine with over easy eggs but tabasco is a must with scrambled. Favorite way is the hashbrown casserole. I like hash browns in my breakfast burritos. I’m going to try this the next time I have guests for brunch. Sounds so tasty! I like to make casseroles using hash browns. I love breakfast casseroles. Love having easy options like this for breakfast! I like hash browns well browned and crispy with eggs over easy. i love hash browns plain with eggs. This recipe looks great! I like my hash brown spicy and crispy all by themselves. Your recipe looks very good! 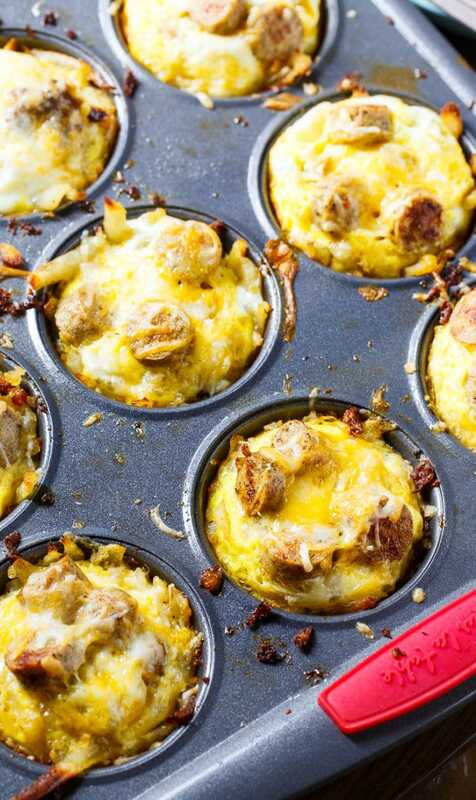 I will have to try these for my next breakfast meal prep! My favorite way is a cheese, ham, and hashbrown casserole. 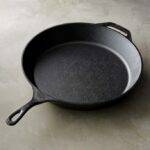 It is ideal to cook this in a cast iron skillet because you get that crisp layer at the bottom. These look delicious! I’m always looking for quick and clever ways to get protein into my breakfast. I like to use hashbrowns to top a lighter version of tater-tot casserole.